Best Quality German Leatherwith comfort design. 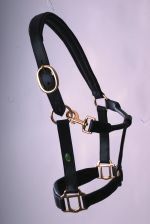 Top Quality bridle made from the finest graine German Leather. Finest German Leather is used for this bridle with an extra wide style fully padded, fully adjustable crank style noseband. 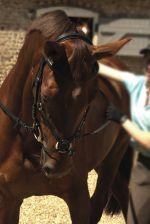 Features 'Comfort' design headpiece with soft padding around ears and clever design gives no pressure on the horses head. Size : Please Select...4'6" 5'0" 5'3" 5'6" 5'9" 6'0" 6'3" 6'6" 6'9" 7'0"